Not smoked, but equally as delicious! 1. Mix the cilantro,  sugar,  salt, pepper and dill together. 2. 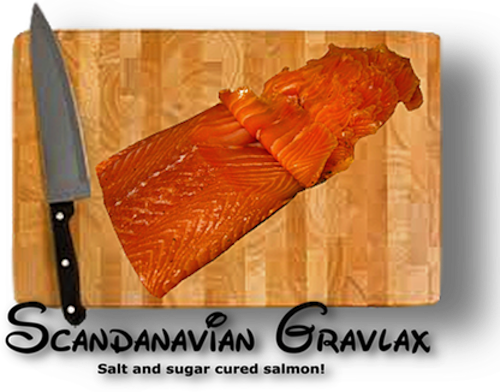 Lay  salmon filets side by side on work surface with the head side of one filet next to the tail side of the other. 3. Divide the spice mixture in half and sprinkle one half over both pieces. 4. Flip one filet over on top of the other making a "sandwich" of the filets with the spices in the center. 5. Take the rest of the spices and generously cover the outside of the sandwiched filets. 6. Lay out a double thickness of plastic wrap and tightly and completely cover the filets. 7. Place the tightly wrapped package of salmon into a like-sized baking dish and weigh down with heavy food cans. 8. Refrigerate the filets for 3 days,  remembering to turn over every 12 hours. 9. Completely scrape or wipe off the spices and serve. 10. To serve,  slice the salmon very thinly and serve on dark bread with flavored mayonnaise,  such as cilantro, dill or jalapeno. (recipe follows). * 2 tablespoons of either (1) fresh cilantro,  fresh dill,  or pickled jalapeno peppers. * 2 cups of your favorite mayonnaise. to feel if any bones are protruding. This is very important!